Share your love to your friends and family by sending them your EzCab referral code today! EzCab will reward you and your love ones discount voucher for the your next ride booking once your friend successfully applied your referral code. Sharing is caring, spread your love to get more rewards! Follow steps below on how to invite your friend and get free promo code each. Tap on "Invite friends" menu. 2a. Tap the " " icon on right of your referral code and paste it into a conversation of your friend. 2b. 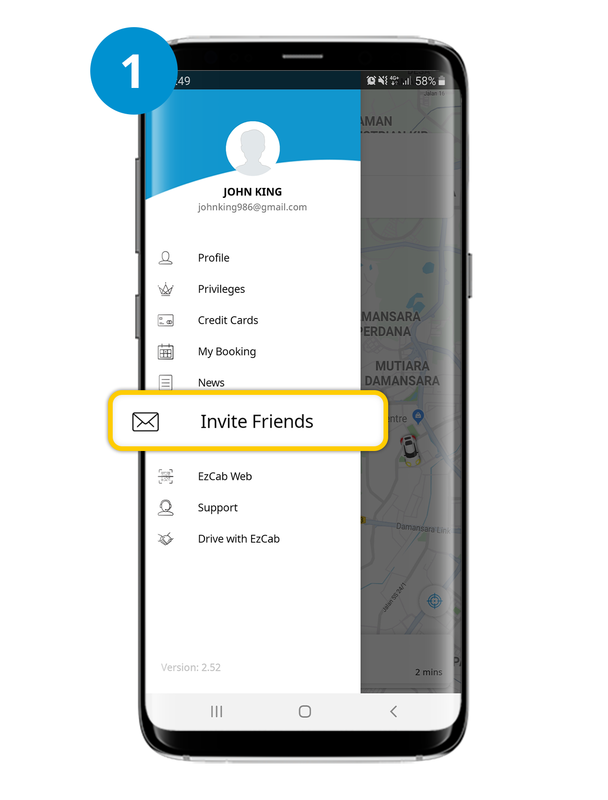 Tap the "Send Invites" and refer to Step 3. May share with your friend via various social networking apps installed on your mobile device. Once your friend installed the app and enters the referral code, both of you earned a RM2 off ride voucher. 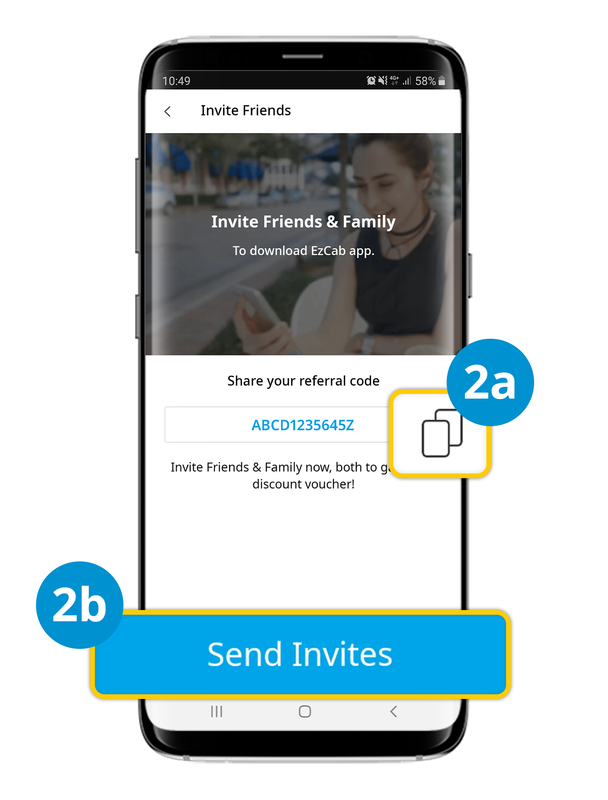 Receive a referral code from your friend? Follow these steps to get your promo code. Redeem your promo code voucher from "My Voucher". Click on the voucher & begin your ride booking! This discount voucher is valid with cash payment only. Available for both existing and new EzCab users. This promotion is only limited to daily first 1000 redemptions. Discount voucher must be clicked in the app before booking. RM2 will be deducted from the fare shown at the end of the ride. If the fare is less than RM2, there will be no reimbursement of the fare difference. If the fare is more than RM2, the additional fare amount will be charged accordingly. A cancelled booking by passenger nullifies the promo entry. Discount voucher is not applicable for Advance Booking. This promo code only valid for ride within nationwide only. A new way to experience your ride with EzCab! 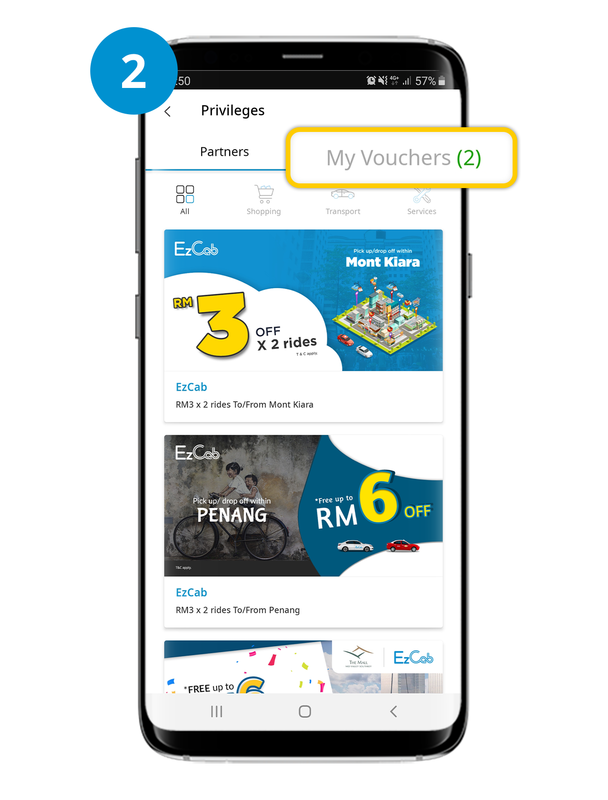 Tap on menu bar, click on ‘Privileges’ and you will find your promo code voucher in ‘My Voucher’. How much do I get after referred a friend? RM2 discount voucher for each referred friend. It may subject to change. Tap on menu bar, click on ‘invite friends’. You shall see your referral code appear on your screen. Where can I share my referral code to? 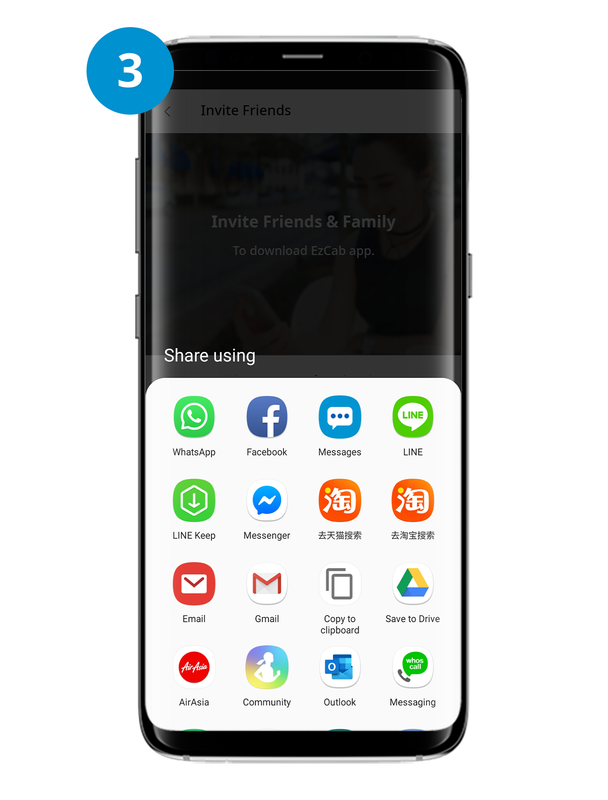 You can share your referral code to your friend via various apps installed on your mobile device. How many friends I can refer? As much as you can! Spread your love and get rewarded!